What’s a ranking without the reasoning behind the method? Here, we go a bit deeper on the first 100 players in the fantasy baseball top 250 rankings. Sure, a top 250 is nice, but what is it without the reasoning behind the rankings? You need to know why a player is worth the investment it will require to get him on your fantasy team, and we’ll provide that for you here, along with 2016 stat projections (via Fantasypros). We’ve focused our efforts on the top 100, which represents the first eight-plus rounds in a 12-team league. Why do we have Mike Trout just ahead of Bryce Harper? What makes Nolan Arenado, and not Josh Donaldson, the top third baseman? How did Lance McCullers sneak his way into the top 100? All that and more will be answered within. You can see the entire top 250 player rankings here, and don’t forget to peruse our position-by-position previews—linked below—which include breakouts, sleepers, busts and more analysis at each position. The name pretty much speaks for itself. Trout has four full major league seasons under his belt, and has never finished worse than second in the AL MVP voting. No player has Trout’s track record and, let’s not forget that he’s also just 24 years old. The Trout vs. Harper debate sparked anew last season when the latter exploded for one of the best seasons any of us has ever seen. Make no mistake, Harper was the best player in the majors last year, leading the league in OBP (.460) and slugging (.649), while also hitting .330 and blasting 42 home runs. Over the last three seasons, Goldschmidt has hit .309/.412/.556, averaged 29 homers and 101 RBI per year and finish second in the MVP voting twice. The one season he didn’t was because he played just 109 games due to injury. The top tier of hitters in fantasy baseball has three players, not two. Rizzo has turned into a bona fide star over the last two seasons, and he enters his age-26 season as the centerpiece of one of the best teams in the majors. He’ll give fantasy owners 35 homers and 100 RBI and, unlike many sluggers, hecould steal 15-plus bases, as well. Arenado has been elite with the glove since his first day in the majors, but he developed into an elite hitter last season, hitting .287/.323/.575. He tied Harper for the NL lead in homers with 42, and drove in an MLB best 130 runs. The cherry on top: Arenado hit more homers on the road than he did at Coors Field. Last year’s AL MVP is ready to reprise his role in the middle of one of the very best lineups in the majors. Donaldson’s counting stats should again be phenomenal, and he proved last year that his low rates in 2014 were the exception, not the rule. Kershaw is the one pitcher worthy of being a first-round pick, and there’s a valid argument for him going as high as No. 4 thanks the gulf between him and the next best pitcher. My favorite Kershaw stat? He’s had a WHIP of less than 1.00 in four of the last five seasons. Machado stayed healthy last year and realized his potential, hitting 35 homers and stealing 20 bases. Speed had never really been part of the 23-year-old’s game, but he certainly put any concerns over his knee to rest in 2015. Talk about being as good as advertised. Correa immediately became the best shortstop in the game upon his promotion last season, hitting .279/.345/.512 with 22 homers and 14 steals in 99 games. Get ready for company, Trout, Harper and Goldschmidt. Stanton is probably going to have a 50-homer season at some point in his career, if he can just stay healthy. He was on pace last year, but played just 74 games. If he could guarantee the fantasy community 150 games played, he’d be a top-five pick. Like Correa, Bryant was just as good as expected last season. He won the NL Rookie of the Year after hitting .275/.369/.488 with 26 homers, 13 steals and 99 RBI. At just 24 years old, there’s likely some more natural power that has yet to develop. Forty homers is within reach. Pollock was one steal shy of a 20–40 season in 2015, but his owners probably didn’t hold that against him. He hinted at his ceiling in a couple of injury-shortened seasons, and finally hit it in his first fully healthy campaign. Leading off atop a great lineup only makes him more valuable. McCutchen is one of the most bankable .300/.400/.500 hitters in the majors. Last year’s knee injury should be a relic of the past, meaning he could get back to a 25–15 season with those phenomenal rates. McCutchen remains a perennial MVP contender. Want to feel old? Cabrera is entering his 14th season in the majors. He’s arguably still the best pure hitter in the majors, slashing .338/.440/.534 last year. He did fail to play 148 games for the first time in his career, but he’s as rock solid as they come. Betts was a chic breakout pick last year, and while it took him some time to get going, he eventually became the player everyone thought he would be. Betts is 23 years old, and his ceiling has him as a perennial 30–30 threat. He could be a first-rounder next year. The Nationals were the most disappointing team in the majors last year, but don’t blame Scherzer. He posted a 2.79 ERA, 0.92 WHIP and fanned 276 batters in 228 2/3 innings. He’s not Kershaw, but he has the ceiling to be the No. 1 fantasy pitcher. Over the last four seasons, Encarnacion has averaged .274/.371/.549 with 38 homers and 106 RBI. At 33 years old, he’s still among the best power hitters in the game, and the Toronto lineup will provide ample RBI and run-scoring opportunities. Sale isn’t quite as bankable as Scherzer, but if I had to bet on one pitcher knocking Kershaw from his perch, it would be the White Sox lefty. He’s simply too good to never win a Cy Young, and he’s going to push 300 strikeouts one of these seasons. Springer hit .267/.376/.459 with 16 homers and 16 steals in just 102 games last year, just his second season in the majors. He cut his strikeout rate to 24.2% from 33%, a sure sign of maturation. This year, superstar pedigree will meet superstar numbers. When is a .290/.347/.502 season with 30 homers and 101 RBI a disappointment? When it falls short of the bar you set in your rookie season. Abreu isn’t getting the love he deserves heading into his third season. If the rates come back a bit, he’ll be a draft-day steal. 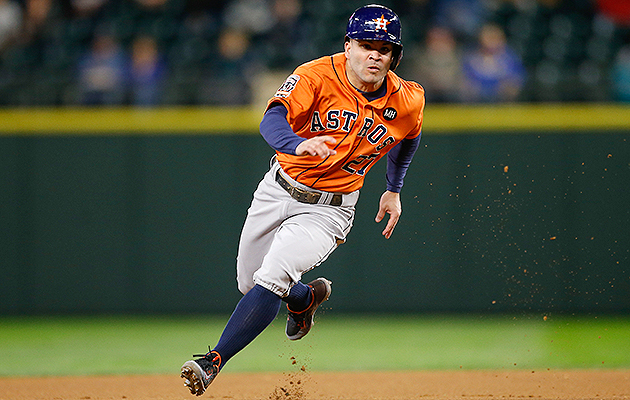 Altuve found a bit more power last season, hitting 15 homers to go along with a .313 batting average and .353 OBP. He swiped 38 more bags and hits atop a potent Houston lineup. I think he can exceed the projections above—12 homers, 40 steals and 100 runs is completely realistic. Bautista is basically the same player as teammate Edwin Encarnacion with a lower batting average and more OBP. Other than that, the two are nearly indistinguishable toward the top of the fantasy rankings. The Donaldson-Bautista-Encarnacion heart of the Jays’ order is the best in the league until further notice. Arrieta allowed us to invoke Bob Gibson’s name without hyperbole last season. His historic second half led him to the NL Cy Young Award, as well as the No. 1 ranking among starting pitchers. He doesn’t need to match last year’s otherworldly numbers to remain a top-five pitcher this season. Marte has three full seasons under his belt, averaging a .286/.345/.446 slash line with 15 homers and 34 steals across those years. He found even more power last year, hitting a career-high 19 home runs, and is in his age-27 season. He’s an easy top-20 hitter. Good Chris Davis returned last year, leading the majors in homers for the second time in two years. Strikeouts are a way of life for him, but he still managed to hit .262 with a .361 OBP last season. You’ll gladly take 200 strikeouts with those rates and 50-homer potential. Martinez exploded last season, leaving the yard 38 times and driving in 102 runs while hitting .282/.344/.535. This was always his ceiling as he was coming up through the Houston system, and now that he has found it, don’t expect him to regress much. Blackmon has become a reliable fantasy commodity over the last two seasons, hitting .287/.341/.445 while averaging 18 homers and 36 steals per year. He’s going to score a lot of runs on top of the Colorado lineup, and can easily climb to 20–40 this year. Gordon won the NL batting title last year with a .333/.359/.418 slash line, led the majors in steals (58) for the second straight season, won his first career Gold Glove and signed a big-money extension during the offseason. That’s a pretty good year. He’s safely the No. 2 second baseman. Fernandez returned from Tommy John surgery in July of last season and was every bit the ace he was before the injury. All told, he racked up a 2.92 ERA, 1.16 WHIP and 79 strikeouts in 64 2/3 innings. There’s no reason to expect him to be anything but the ace he was his rookie year. Greinke enjoyed the best season of his career in 2015, posting a 1.66 ERA, 0.84 WHIP and 19 wins while finishing second in the NL Cy Young voting. He doesn’t have the fantasy ceiling of the pitchers ahead of him because he’s can’t quite match them in strikeouts. 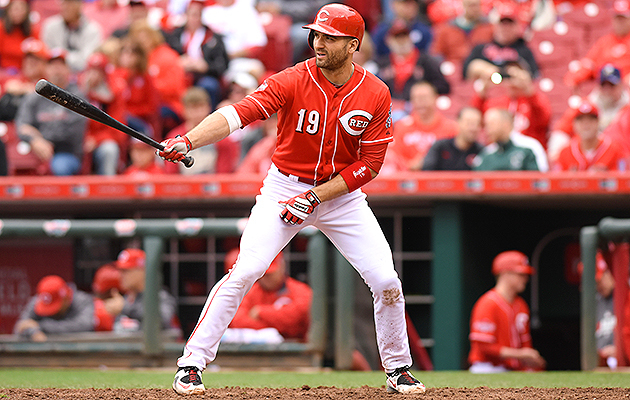 Votto, one of the best all-around hitters in the majors, had a resurgent 2015, hitting .314/.459/.541 with 29 homers. Injuries are a concern, and last year’s home run total probably represents his ceiling but he’s a four-category player who can also steal you 10 bases in a good year. Forget about last year’s injury-riddled campaign. Gomez hit .284/.347/.491 across 2013 and ’14 with an average of 24 homers and 37 steals per season. He’s fully healthy and hitting in the middle of what should be a strong Houston lineup. Gomez will be a bargain this year. It wasn’t Matt Harvey or Noah Syndergaard, but deGrom who was the Mets best pitcher last season, putting himself in the Cy Young discussion in his first full season in the majors. He fanned 205 batters in 191 innings and had a WHIP south of 1.00. An ace in every sense of the word. Bumgarner followed up his World Series MVP with the best individual regular season of his career, totaling a 2.93 ERA, 1.01 WHIP and 234 strikeouts in 218 1/3 innings. He has made at least 31 starts five years in a row, brining as little injury risk as possible for a pitcher. Fantasy owners often overrate positional scarcity, but Posey is the one player who deserves that bump. He really does make a difference by being so much better than every other catcher, before you even get to the way his numbers compare with other hitters at his ADP. Braun quietly put together a strong 2015, slashing .285/.356/.498 with 25 homers, 24 steals and 84 RBI. Braun is the rare power hitter who has continued to run into his 30s, and while he may not be a 35-homer threat, he has a real chance to go 25-25 this season. If Strasburg were guaranteed to make 30 starts this season, I’d rank him as the No. 3 pitcher behind Kershaw and Scherzer. Remember, he posted a 4.60 ERA in April and 10.13 ERA in May before hitting the DL. In the second half, Strasburg had a 1.90 ERA and 0.75 WHIP. So much for the Pacific Northwest weather or spacious Safeco Park sapping Cruz’s power. He mashed a career-high 44 homers last season to go along with a .302/.369/.566 slash line. Those rates may not return this year, but he’ll again be among the premier power hitters. Environment is important, and no player in the majors improved his environment more than Upton during the offseason. He left behind Petco Park and the anemic San Diego offense for Detroit’s loaded lineup. Upton should be a counting stat monster this season. Possibly my favorite pitching target this season. Carrasco jumped up a level last year, and there could be more in store for 2016. If anyone is this year’s Jacob deGrom, he is it. You probably won’t have to use a pick this high to secure his services. Cespedes galvanized the Mets lineup last summer, and he’ll be counted on to do the same this year. Whether or not you end with Cespedes will depend on how much you believe in last year’s power surge. Someone in your league will, meaning he’ll likely go higher than this. 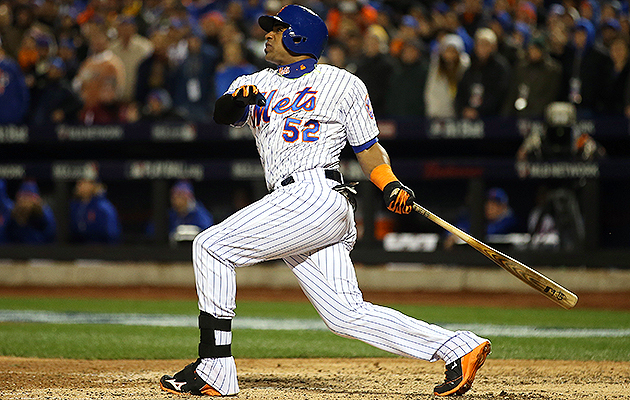 • ​WATCH: Does Cespedes’s personality boost morale in Mets’ locker room? Cain finished third in the AL MVP voting last year, hitting .307/.361/.477 with 16 homers, 34 doubles and 28 steals. Cain is a big guy at 6' 2" and 205 pounds, but he never had more than seven homers in a year before 2015, his age-29 season. Kluber’s ERA climbed up from his 2014 Cy Young season, an inevitable result of allowing eight more homers, but he had a lower WHIP (1.05) and struck out 245 batters in 222 innings. In other words, Kluber remains a real-life and fantasy ace. Frazier had one of the more bizarre 2015 seasons, looking like an MVP candidate in the first half and literally one of the worst position players in the majors in the second. Having said that, we know his power is legitimate, and he should take well to U.S. Cellular Field. • ​​BELLER: Should owners expect a dropoff from Frazier again? Cole made 30 starts for the first time in his career last year, amassing a 2.60 ERA, 1.09 WHIP and 202 strikeouts in 208 innings. He hasn’t quite been the strikeout artist in the majors he profiled as coming up through the minors, but we’re picking nits with that criticism. Hernandez remains a legitimate fantasy ace, but it’s worth there’s no way around the fact that he posted a career-high ERA and the third worst FIP of his 10 full major league seasons. He’s still great by any definition of the word, but not quite fantasy elite. Gonzalez managed to play 150 games for the first time in his career last season and rewarded his fantasy owners with 40 home runs and 97 RBI. He is forever an injury risk and had just a .325 OBP last season. There’s also a real chance he gets traded, losing the Coors Field bump. Tulowitzki quietly had one of the worst per-game seasons of his career in 2015. He’s still a top-50 player since he can hit 30 homers as a shortstop, but you’ll have to circle back to the position later in your draft because he’s going to miss time due to injury. You have to love him in Toronto’s lineup, though. Sano was yet another standout rookie last year, hitting .269/.385/.530 with 18 homers in just 335 plate appearances. There’s no doubt his power is for real, and the Twins are committed to him in right field, so he won’t clog your utility spot. There’s a 35-homer ceiling this year. If you get the Hosmer of 2013 or ’15, you’re getting a player who will give you great rates, close to 20 homers, and floors of 80 runs and RBI. Understand, however, that there is a significant dropoff from Joey Votto and Chris Davis, the two first baseman ranked immediately ahead of him. 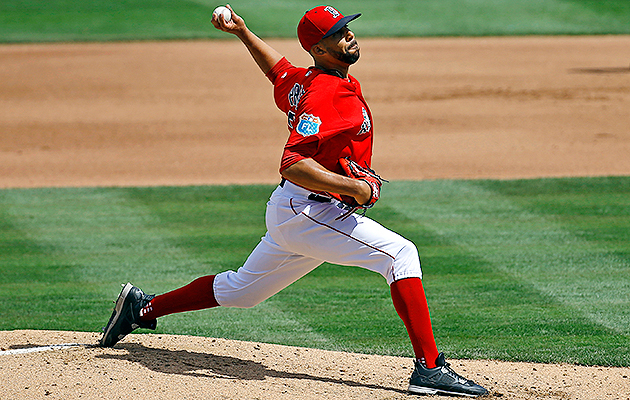 Price joined his third AL East team this offseason, becoming the new ace of the Red Sox. He turned 30 last August but still put together a wonderful season, leading the AL with a 2.45 ERA and fanning 225 batters in 220 1/3 innings. He’s a plug-and-play ace. Heyward spurned the Cardinals to sign with the Cubs during the offseason. Entering his sixth year in the majors, Heyward is still just 26 years old. 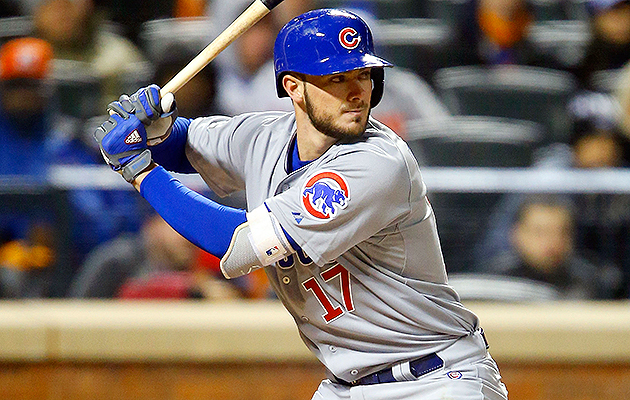 He found himself again last year, hitting .293/.359/.439, and could score 100-plus runs at the top of the Cubs’ lineup. The defending AL Cy Young Award winner is outside our top-50 players because he just doesn’t have the strikeout upside necessary to be an elite fantasy starting pitcher. With that said, you’ll be in fine shape if he’s your No. 1 pitcher. Archer broke through last season, notching a 3.23 ERA, 1.14 WHIP and 252 strikeouts in 212 innings. He went 12–13 and could deal with that same bad luck this season, but he has no control over that. Like Keuchel, he may not be fantasy elite, but he’s a strong No. 1. It’s entirely possible that Harvey will be the third-best pitcher in his own rotation while also being a top-10 pitcher in the league. Harvey made 29 starts after missing the entire 2014 season due to Tommy John surgery and finished as the No. 10 starting pitcher in 5x5 leagues. Carpenter traded contact for power last season, a swap that surely made his fantasy owners. He hit a career-high 28 homers, and still managed to slash .272/.365/.505. He also smacked 44 doubles, so the power surge appears legitimate. Carpenter remains underappreciated. It’s going to be a long year in Atlanta, and that could really have an affect on Freeman’s numbers. He remains a quality fantasy first baseman, but the lineup around him could be the worst in baseball. He’s just not going to have the opportunities he did in previous years. Polanco slashed .276/.324/.425 with six homers, 20 doubles and 10 steals after the All-Star Break, which translated to 14 homers, 47 doubles and 24 steals over 162 games. Polanco is a prime breakout candidate in his age-24 season. That Syndergaard finished fourth in NL Rookie of the Year voting tells you how good the crop was last season. The 23-year-old arguably has a higher upside than teammates Jacob deGrom and Matt Harvey, and he showed his durability last season, throwing 169 innings. Peralta built on a solid rookie season with a phenomenal second year, slashing .312/.371/.522 with 17 homers and 78 RBI. Peralta has hit at every level since remaking himself as an outfielder, and there could still be further growth in his bat. 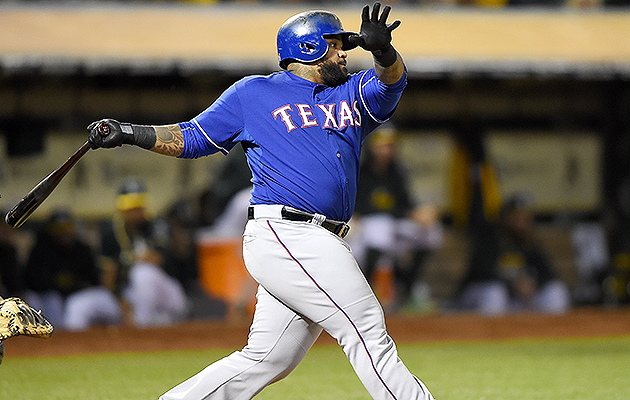 Fielder bounced back last year with a .305/.378/.463 slash line and 23 home runs. That’s undoubtedly his ceiling coming into this year, and it’s entirely possible he falls under 20 home runs with his power diminishing. In other words, give me Eric Hosmer. If Pence is healthy, which he was every year of his career until last season, he’s one of the safest commodities in baseball. He’ll give you .280/340/.470 with 20 homers, 15 steals, 70 runs and 80 RBI. That will play in any fantasy outfield, regardless of format. Joe Maddon is going to have to figure out a way to get Schwarber enough playing time, but there’s no doubting the power and plate discipline the 23-year-old showed last season. He’ll spend most of his time in the outfield, but he’s this high in the rankings because of his catcher eligibility. Cano is on the back nine of his career, but he still gave his fantasy owners a .287/.334/.446 slash line with 21 homers, 79 RBI and 82 runs last season. That’s a great season for a second baseman, and he could have more RBI opportunities with Nori Aoki and Ketel Marte in the lineup all year. Gray is a better real life pitcher than he is in fantasy, and that’s saying a lot because he was the No. 11 fantasy starting pitcher last year. His limited strikeout upside keeps him out of the elite tier, but he has a career 2.88 ERA and 1.13 WHIP in 491 innings. At this stage of his career, Wainwright is Gray with a much longer track record and not quite as much upside. He, too, doesn’t strike out a ton of batters anymore, but he’s every bit the real-life ace he has always been. Wainwright can still be a No. 1 on a winning fantasy team. Jones has a safe, projectable floor, but his ceiling isn’t much higher. He should hit 25-plus homers, drive in 80 or more runs, and give his owners a good batting average. On the down side, he doesn’t run very much anymore, he’s a negative in OBP, and his OPS+ has fallen three consecutive years. We keep waiting for Ortiz to slow down, and he keeps on hitting dingers. Last year, in his age-39 season, Ortiz circled the bases 37 times and slugged .553. He has hit at least 30 homers in each of the last three seasons and should end his career on a high note. If Ross could ever cut his walk rate to league average, he’d be a top-15 starting pitcher. Last year he whiffed 212 batters in 196 innings, allowed just nine homers, and posted a 61.5% ground-ball rate. He also walked nearly four batters per nine innings. Dozier has turned into the most prolific power hitter at his position, belting 18, 23 and 28 homers the last three seasons. He has scored more than 100 runs two years in a row, but is a significant risk in both batting average and OBP. 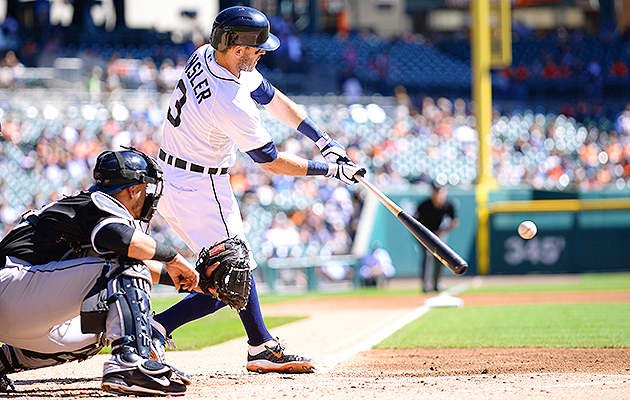 Kinsler’s power continued to decrease last year, but he still gave his fantasy owners 11 homers and 11 steals, while posting a .296/.342/.428 slash line and scoring 94 runs. Given the firepower behind him in Detroit’s lineup, he could lead the league in runs this year. Think of Gonzalez as very similar to Prince Fielder. Yes, he had a good 2015 season, but that represents his ’16 ceiling and, just as importantly, if you’re buying him you’ve likely missed out on the superstar tier at the first base position. You want to do better here. Dickerson lost about 100 games due to injury last year but was himself when healthy, hitting .304/.333/.536 with 10 homers in 234 plate appearances. The bigger issue for him will be leaving behind Coors Field, but he is still undervalued in his new home. Few players have as wide a range of realistic outcomes as Puig does this year. Two hamstring injuries effectively cost him last season, but we can’t forget that he was nowhere near as good in 2014 as he was in his rookie season on a per-game basis. Medium risk, high reward. Lester started the 2015 season slowly, as he usually does, but ultimately put up the sort of season-long numbers his fantasy owners expected. In fact, the first two years of his 30s have been the best consecutive seasons of his career. Expect him to keep on rolling. Forget about last season and go back to 2014 when Rendon was slashing .287/.351/.473 with 21 homers and 17 steals in his age-24 season. The fantasy baseball community is sleeping Rendon on to a silly degree. He’ll bounce back in a big way. Don’t be fooled by the 40 homers last season—Pujols is not someone you want to count on this year. For one thing, he’s unlikely to be ready for Opening Day. For another, he went in the tank in the second half. Another significant decline could be looming. Remember the Stroman breakout bandwagon last year? Let’s get it revved up for 2016. He essentially lost the ’15 season to a torn ACL suffered in spring training, but everyone we loved about him before the injury still holds. He could be a top-20 starting pitcher. Hamels isn’t likely to be a rate superstar, but he’ll give you an ERA in the mid-threes, WHIP around 1.20 and a strikeout per inning. He’s clearly behind every pitcher ahead of him other than Stroman, but there’s still a lot of value in his left arm. Kipnis didn’t just bounce back last season. He had arguably the best year of his career. The 28-year-old hit .303/.372/.451 while making his second All-Star game. He did hit just nine home runs, but he still projects as at least a 10-homer, 15-steal player with great rates. Brantley will be one of the most interesting players on draft day as he continues to rehab a shoulder injury. He’s well worth the risk given that a worst-case timeframe puts him back in the middle of May, and he still could be back within the first few weeks of the season. In four full years as a major leaguer, Seager’s average season is .263/.329/.438 with 23 homers, 33 doubles and 81 RBI. He has never hit fewer than 20 homers, and topped out at 26 last season. He won’t disappoint, so long as you have realistic expectations. Liriano continues to dazzle in his career’s second act, putting up a 3.38 ERA, 1.21 WHIP and 205 strikeouts in 186 2/3 innings last year. He also made 30 starts for the first time since the 2010 season. He’s a strong No. 2 or 3 in all fantasy formats. Cueto returns to the National League and gets a ballpark boost in San Francisco, but there’s some real risk here. He had a few injury scares, though he never hit the DL, and he’s entering his age-30 season. Remember, too, that Cueto is not a big strikeout pitcher. Iglesias is a breakout candidate this year after a sparkling debut last year. In 95 1/3 innings, he struck out 104 batters and put up an xFIP that was a full run lower than his ERA. His swing-and-miss stuff gives him a top-20 ceiling at the position. Kemp had one of the quietest 100-RBI seasons a year ago that you’ll ever see. He’ll be hurt by Justin Upton’s departure, but he proved he can still hit 25 homers even playing half his games at Petco Park. Pencil in 20-homer and 80-RBI floors. Ellsbury was in the midst of a fantastic season before a knee injury robbed him of 50 games. He was never the same after the injury, and enters this season as a very risky player. The history is bad for speed-dependent players in their 30s with previous leg injuries. If you wait this long to take Davis, you won’t get him. As you can tell, we don’t have a high opinion of closers in the fantasy world here. Yes, Davis will strike out a lot of batters this season, but you want to be investing your primary resources on hitters and starting pitchers. McCullers is another favorite of mine after he fanned 129 batters and put up a 3.22 ERA and 1.19 WHIP in 125 2/3 innings as a rookie. At just 22 years old, there’s plenty of growth potential for him over the next five years. He’s going to be a steal in 2016. Eaton got off to an awful start last season, but ultimately hit .287/.361/.431 with 14 homers, 18 steals and 98 runs. The power was a pleasant surprise and should not be counted on, but his projected stats are within reason. 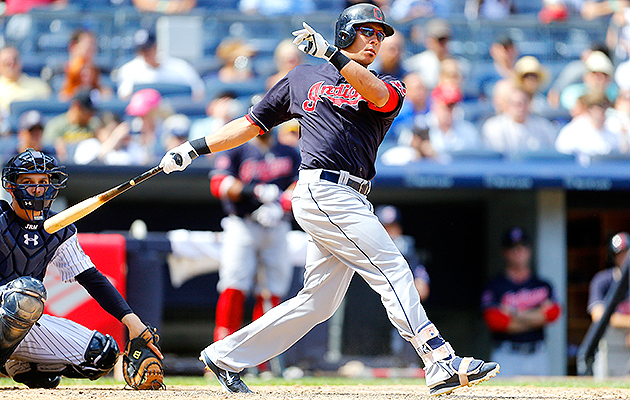 Santana draws walks, hits for solid power and bats second in the Cleveland order. That’s a great recipe for any player, let alone one who will be cheaper than this on draft day. Downgrade him a bit in batting average leagues, where he can be a real drag. The sky’s the limit for Seager in his first full major league season after he slashed .337/.425/.561 in 27 games with the Dodgers last year. Don’t expect a Carlos Correa impact, but he could end up hitting 20 homers if he sticks as a 22-year-old in 2016. Everything finally clicked last season for Salazar, who racked up 195 strikeouts in 185 innings with a 3.45 ERA and 1.13 WHIP. At just 26 years old, he could still be getting better in terms of commanding his entire repertoire. Revere is going to do what he always does—get on base and swipe bags. Doing that in front of Anthony Rendon and Bryce Harper could lead him to the best season of his career. Expect .300/.340/.360 with 30 steals and 90 runs. Just like Wade Davis, you’re going to have to act earlier to nab Kimbrel. Don’t put too much stock into what was a bad year by his standards in 2015. He remains an elite closer who’s going to strike out about 1.5 batters per appearance. There are some concerns about Martinez’s shoulder, but as long as he’s healthy, he has the highest upside in the St. Louis rotation. We’ve already seen him 109 times in his major league career, but he’s just 24 years old and is coming off a season in which he fanned 184 batters in 179 2/3 innings. Jansen cemented himself among the best closers in baseball last year, striking out 80 batters in 52 1/3 innings with a 0.78 WHIP to match. There’s nothing for a fantasy owner to lament with Jansen, other than the exorbitant draft-day cost for a top-tier closer. Grichuk hit 17 homers and had a 19.1% HR/FB ratio and .272 isolated slugging percentage as a rookie in 2015. The only players to match those rate thresholds were Bryce Harper, Chris Davis, Mike Trout, David Ortiz and Edwin Encarnacion. A breakout is coming. Calhoun is admittedly a boring selection, but he should hit somewhere between 22 and 26 homers with likely floors of 80 runs and RBI. The batting average and OBP aren’t going to help much—it could potentially hurt—but he has value at this stage of a draft. Richards rebounded from the gruesome knee injury that ended his 2014 campaign to go 15–12 with a 3.65 ERA, 1.24 WHIP and 176 strikeouts in 207 1/3 innings. That he was able to make 32 starts and throw as many innings as he did tells us he’s fully healthy entering this year.